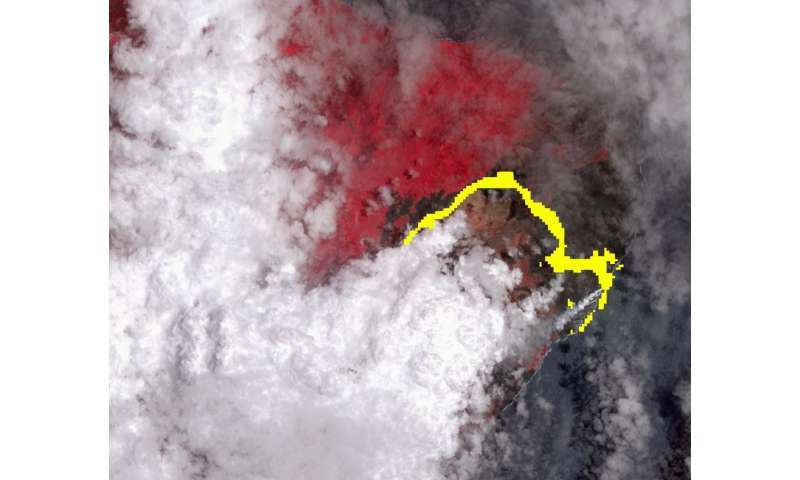 New NASA satellite imagery captured a hot lava flow from fissure 8 of Hawaii's Kilauea volcano. The flow from fissure 8 extends from the Leilani Estates to the Pacific Ocean—with main ocean entry points near Ahalanui. The imagery, from the Advanced Spaceborne Thermal Emission and Reflection (ASTER) radiometer instrument on NASA's Terra satellite, was taken on Wednesday, July 25. Vegetation is shown in red, and clouds are white. The hot lava flows detected by ASTER's thermal infrared channels are overlaid in yellow. The image covers an area of 9.5 by 11.5 miles (15.3 by 18.6 kilometers). Fissure 8 is one of the most active fissures of many that have broken ground since Kilauea began erupting in early May. Flying debris from the explosive interaction between lava and water is a serious hazard near ocean entry points. The interaction also creates laze—plumes laden with hydrochloric acid and volcanic particles—that can irritate the eyes, lungs and skin. Kilauea is one of the world's most active volcanoes. It is the youngest and southeastern-most volcano on the Island of Hawaii.